Thank you for the birthday gift, Erin. It’s just what I wanted. 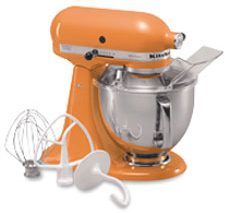 I’ve been asking for a KitchenAid stand mixer for years, and Erin found this brand-new tangerine beauty on eBay for about half what it would have cost retail. I’ll probably make bread tomorrow.